Part 3: When should I start Planning? 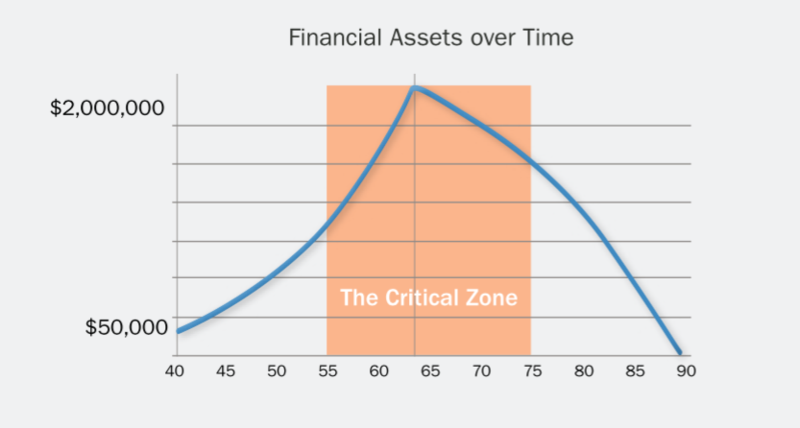 The Critical Retirement Zone is the 10 years before and the 10 years after retirement. The 50 odd years that you have spent getting to this point in your life are insignificant in comparison to the importance of getting your financials right during this 20 year stage of your journey. By Getting Ready for retirement during this phase you can easily double or triple your retirement nest egg, but the risks you face are far more abundant and pronounced then they were in the past. All of these things lead to you having the greatest ability in your life to save money. Where is the money going? – While you are saving more than you have in the past, you need to make sure you are buying the right investments at the right price because you only have a limited timeframe until you need to draw upon them when you retire. $500,000 invested is $125,000 loss! Impact of cash flows – When you are putting money into super and markets are low – it’s a good thing (buy low, sell high). However, when you are taking money out, low markets are a bad thing. What if markets are low when you retire? As you can see, if you are in the Critical Retirement Zone your need for having a plan is paramount. When most people (and even many financial advisers) think about getting ready for retirement they think about how to build their wealth to that magical number of savings they will need to retire. While these strategies are highly valuable for moving you in the right direction, true retirement planning is about thinking about the entire Critical Retirement Zone and beyond. How will you turn these savings into an income when you get there, what could go wrong along the journey towards retirement, what could go wrong once you retire and how do I put a plan in place to minimise the risks and maximise the opportunities? The key is having a clear plan that maps out your future retirement goals in terms of income and capital requirements and then reverse engineering a personalised strategy from that point to your current position. The key is Ellerfield’s retirement FOCUS2 ®.